Alyssa Navares wears one of Ginger13's versatile fall necklaces ($81) combining lace, metal chain and agates. It will be available in boutiques in mid-August. FANS of Ginger13 had two opportunities to meet the mysterious woman behind the jewelry line last week when CrazyBeautiful celebrated its one-year anniversary July 19 and Bamboo Sky hosted a "Retail Therapy" women's pamper party Thursday. Designer Cindy Yokoyama likes it that way. Place: O Lounge, 1349 Kapiolani Blvd. "You always hear the name of the designer, but when I was thinking of a name I wanted to do something different," she said. "When I meet people they're amazed because they'd heard of Ginger13 but didn't know the name behind the brand." Shopping addicts will have another opportunity to meet the local jewelry designer Sunday at the second Women's Closet event at O Lounge. A percentage of sales from the shopping and pampering event -- featuring free mini massages and manicures from Ho'onani Spa -- will benefit the Domestic Violence Clearinghouse & Legal Hotline. Featured for sale along with Ginger13 jewelry will be the eco-chic designs of Roberta Oaks, swimwear by Erika Ireland of Hula-la, plus clothing and accessories from MisFortune, KariJane Threads, Global Village, Second Skin, and J. Boudoir Corsetiere. 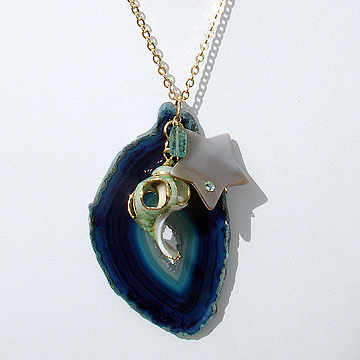 Ginger13 summer designs incorporating seashells, semi-precious gems, crystals and agates in light colors will be featured at the O event, reflecting what might be described as a three-dimensional and wearable approach to Yokoyama's art. She had grown up drawing and painting, but when it came time for higher education, Yokoyama decided to give the University of Hawaii at Manoa's fashion design and merchandising program a try. "You always hear about starving artists, so I didn't know if a career in the arts would work out," she said. "But once I started to attend the university, I realized art was my calling. I tried to do fashion, but it was too much business for me." One of Ginger13's versatile fall necklaces. Preferring the independence and immediacy of art-making, Yokoyama graduated with a bachelor of fine arts degree in painting. 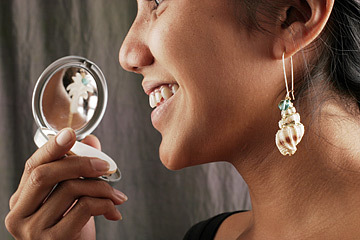 Her artist's eye now lends itself to silver, gold-filled and gold-plated earrings, bracelets, necklaces and popular pull-through lariats inspired by Hawaii and its natural elements, including seashells, wood, coconut shells and kukui nuts, in multiple and mismatched pairings. Pieces start at about $66, with none topping $100. She said her customers particularly enjoy the mismatched, off-kilter and asymmetrical aspect of her wearable art as she combines mixed-media objects in a variety of colors and textures, perhaps fueled by her appreciation for abstract work. Alyssa Navares wears earrings ($66) from Ginger13 in signature mismatched style. She's at work on her fall collection, utilizing dark woods and stones paired with lace, leather and silk cords, in addition to metal chains. Working alone until midnight or 1 a.m., she's intent on making all the jewelry by hand herself for as long as possible, selling it through such local boutiques as MisFortune, CrazyBeautiful, Bamboo Sky, Pineapple County, others on the Big Island and Kauai, boutiques from California to New York, and her own Web site, ginger13.com. 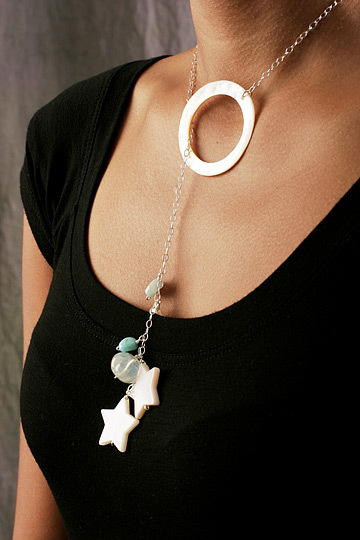 A pull-through summer lariat ($77). Yokoyama quit a florist job to work full time on her jewelry line -- named after her dog and her family's lucky number -- and admits those fashion merchandising classes would have come in handy now that she also has to manage her own bookkeeping, account management and styling, in addition to designing and timing her collections to coincide with retail schedules. "It's a hard transition for me because I have to work so far ahead," she said. "Right now, we're in summer, but as far as retailers' needs, summer was months ago. "I'm getting a lot of help from local boutique owners and other designers who have given me a lot of advice." That includes learning the balancing act of being current while avoiding trendiness. "I don't want my pieces to be too trendy because I want people to be able to wear them every season." 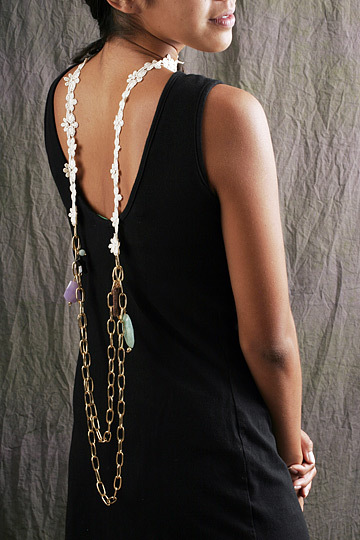 A modelwears a shell charm necklace ($66). Pieces will sell for less at The Women's Closet. Despite the responsibilities and stress of running her small business, Yokoyama is eager to continue expanding into other markets. "I did not expect to have my own business, but something is happening in Hawaii with so many designers emerging and so many boutiques opening," she said. "I see a big shift in fashion here and it's been the perfect time for me."